No country in the world demonstrates such enduring reverence for the Great Mother Goddess, as does India. The Goddess is celebrated in every form, aspect and quality, through music, art, ritual, mantra and meditation. She is honoured in women, the Earth, nature and the transcendent beyond all expression. Her worship is full of splendour, delight, mystery and wonder. The Goddess is Shakti, meaning power, the resort of all transformative energy and cataclysmic force that mere human logic cannot comprehend. She possesses martial and regal forms that all must bow down before in awe. During the Navaratri – India’s famous autumn festival of the Goddess – she is worshipped as Durga, the supreme Shakti, holding all majesty, wisdom and grace. Durga is the Mother of the universe from who comes forth the creation, sustenance and dissolution of all beings and all worlds. She is Chit-Shakti, the power of consciousness, out of which the cosmos coalesces as matter, life and mind. India as a sublime culture and profound civilisation is the gift of Ma Durga. Durga is the Goddess who personifies India as a whole and its incredible vitality, from her presence in village shrines to her representation of the highest yogic spirituality. Bharat mata is Durga with her imperious lion. She was the image behind India’s independence movement, which worked through her inspiration, such as Sri Aurobindo so eloquently lauded. Durga means she who takes us beyond all difficulties. She is the divine energy that protects the soul from duality, adversity and opposition, known and unknown. As Durga-Tara she delivers us across the turbulent ocean of ignorance to the radiant other shore beyond all darkness. She carries us over all dangers like a ship across the sea, as Vedic chants poetically reverberate. The Government has taken several initiatives to enhance the role of MSMEs in the defence sector. Augmenting the role of MSMEs in defence sector is one of the defining features of Defence Procurement Procedure (DPP)-2016. In the DPP-2016, the ‘Make’ procedure has been recast wherein greater impetus has been provided to MSMEs, by reserving certain categories of ‘Make’ Projects exclusively for them. The eligibility criteria for Shortlisting Indian Vendors, for participation in ‘Make’ projects, has been made liberal for MSMEs. Besides this, a multiplier of 1.5 is permitted for discharging of offset obligations through MSMEs as Indian Offset Partner. In addition, the Government has launched various schemes for supporting MSMEs so that they can supply their products to various organizations including defence sector. The Lean Manufacturing Competitiveness Scheme was launched to improve the quality of the products of MSMEs. The MSMEs can upgrade their machinery under Credit Linked Capital Subsidy Scheme (CLCSS) and Technology Up-gradation Scheme (TEQUP). The units can also avail credit guarantee trust fund for MSEs to raise loan without collateral security for enhancing their competitiveness. MSMEs can also participate in Domestic and International Trade Fairs under Marketing Assistance and Technology Up-gradation (MATU) scheme. The Government of India has notified Public Procurement Policy for Micro and Small Enterprises (MSEs) Order, 2012, under which a minimum of 20% of the total annual procurement from Micro & Small Enterprises by Central Ministries / Departments / PSUs has become mandatory w.e.f. 1st April, 2015. The same is also applicable to the defence sector. Terrorism is not new to Bangladesh nor is the government’s concerted effort to thwart it. For three years, the country has witnessed spasmodic attacks on freethinkers, religious minorities, and foreigners. Both al-Qaeda affiliates and the Islamic State group have taken credit for these horrific acts, though until July the threat had largely come from within, not from the outside. Just before the July tragedy, Bangladeshi authorities launched an unprecedented campaign to combat terrorism within its borders. As part of this effort, the governing Awami League, backed by the pro-liberation 14-party alliance, initiated a plan to pinpoint terrorist suspects and to undermine their ideological justifications for violence. Since early summer, security forces have arrested several dozen potentially dangerous militants, including members of banned organizations like Jamaat-ul-Mujahideen Bangladesh (JMB), Hizb ut-Tahrir, Ansarullah Bangla Team, Ansar al-Islam, Harkat-ul-Jihad, and Allaher Dal. Security forces also arrested leaders of Jama’atul Mujahideen, Ansarullah Bangla Team, and Islami Chhatra Shibir. These crucial arrests have visibly weakened the most threatening organizations in Bangladesh. 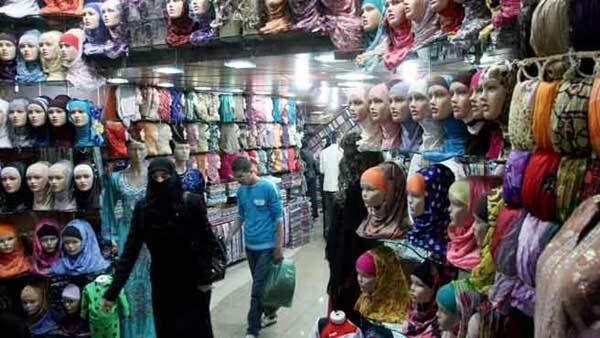 *** Kashmiri Shops in Tourists Spots - Is there More than What Meets the Eye? While all suspect tax evasion and money laundering of corruption or crime proceeds merit investigation, the curious case of Kashmir shops that pay rent in excess of market rates but do not attract customers raises the additional dimension of insurgency and terror financing. During a 2012 visit to Nainital, one was surprised to see many Kashmiri shops on the Mall Road. All through a three day stay, we walked by the Mall at various times of the day but rarely found a customer in most of the shops. It was tourist season and the products on display were likable, so the empty shops were surprising. This shop, too, gets very few customers. It had about eight sales persons. Being a qualified accountant, the question that came to mind immediately was its financial viability! That got one curious! On day three, I spoke to a few locals who still have shops on the Mall. They said Kashmiris paid rents that were much higher than the going rate, about 1.4 times. Therefore, locals were more than happy to lease their shops to them. The next question, how are shop owners making money when rent is so high and few customers visit? A local said this was something they were unable to fathom either. He shared an unintended effect – because the monthly rent, in absolute terms, was high, many landlords developed bad habits. Fast forward to 2016. Close to the Maratha Palace at Thanjavur, Tamil Nadu, is a Kashmiri shop. One walked through the shop’s three levels and admired the range and design of products. Wanting to compliment the owner, the writer walked up to the cash counter and during the conversation, learnt that the owners were from Kashmir. This shop, too, gets very few customers. It had about eight sales persons. Being a qualified accountant, the question that came to mind immediately was its financial viability! The Soviet Union earlier, and Russia thereafter, have been the most reliable suppliers of state-of-art armament for India’s defence forces. India and Russia have an institutionalized structure to oversee the complete range of issues of military technical cooperation. The India-Russia Inter-Governmental Commission on Military Technical Cooperation (IRIGC-MTC), set up in 2000, is at the apex of this structure. 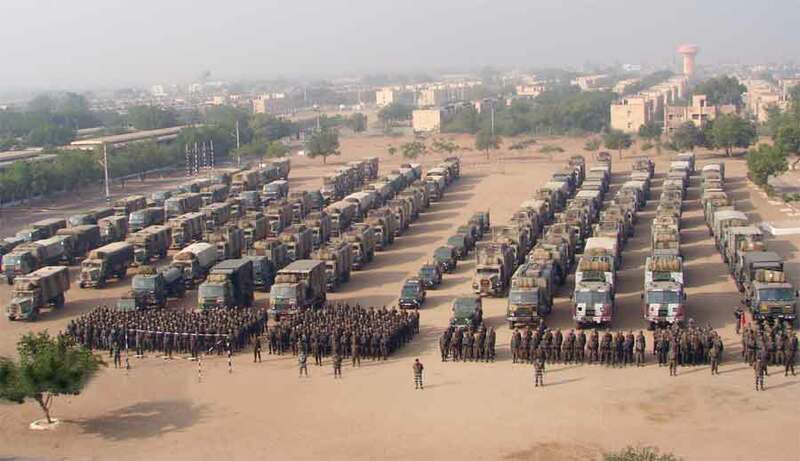 The backbone of India’s military deterrence, in the form of frontline offensive equipment like the Sukhoi 30 MKI combat aircraft of the IAF, the Navy’s aircraft carrier INS Vikramaditya, Rajput class guided missile destroyers and the nuclear submarine, as also the T-90 main battle tank and BMP II infantry combat vehicles (ICVs) of the Indian Army are all of Russian origin. In fact, the MBTs and ICVs are manufactured under license in the Medak and Avadi Ordnance factories. In addition, other critical military equipment in the Indian inventory like long range artillery, air defence missiles, attack submarines, medium helicopters, surveillance aircraft and transport aircraft have also been majorly sourced from Russia. More recently, the ‘buyer-seller relationship’ has transformed to a new approach involving joint research and design development for production of ‘state of the art’ military platforms. Joint development and production of the Brahmos cruise missile and joint development of the fifth generation fighter aircraft (FGFA) signify landmark advancements in the field of defence technological cooperation between the two countries. The supply and joint manufacture of two hundred Kamov 226T helicopters for the Indian military, as part of the Indian Govt’s ‘Make in India’ initiative, puts Russia at the forefront of the new model of India’s equipment procurement procedure. Since 2003, naval ships and army units from Russia and India have been participating in combined annual military exercises called ‘Exercise Indira’, alternately in either country. This has enabled both countries to build relationships, share tactics, techniques and procedures as well as gain knowledge about each other’s military and ethos. South Asia is in for some exciting times ahead with fast changing geo political developments with primary focus being on connectivity. China’s quest to establish “One Belt One Road”, an end to Iranian isolation and Afghanistan’s desire to break free from the stranglehold of a belligerent neighbor have seen exciting churning in recalibrating of relationships in South Asia. 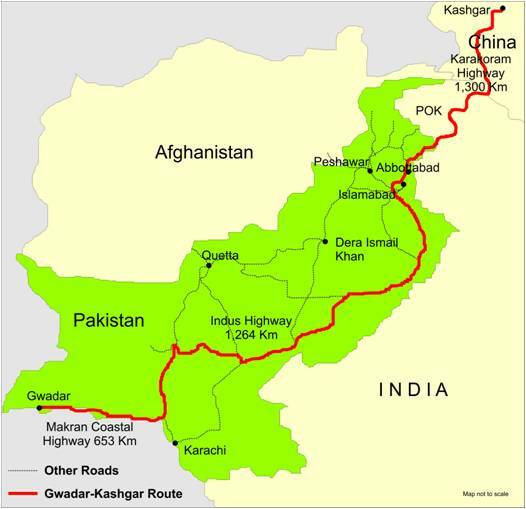 Development of two significant corridors; International North South Transport Corridor (INSTC) and China Pakistan Economic Corridor (CPEC), both with significant economic dimensions and converging of strategic interests in the region is determining new alliances and geo politics. The developments have potential to exacerbate uncertainties and tensions in the days ahead. For last couple of weeks China initiated China Pakistan Economic Corridor (CPEC) has been the cynosure of Pakistan’s political, military and strategic establishments, who have been singing paeans about the virtues of the project, referring to it as the pinnacle of Pakistan- China relations. However what is most interesting is the hype that is being fed to people of Pakistan about CPEC and the project billed as a solution to all the economic woes confronting Pakistan. It is still early days for the project where work has just begun. The finality is expected to be achieved by 2030. From the view point of Indian strategic interests is another major project; International North South Transport Corridor (INSTC), which has been in the works for close to one and half decade. The project is of significant interest to enable expansion of economic and energy cooperation between Russia, Central Asia and India that will bypass Pakistan. The project received an impetus with conclusion of the Tripartite Agreement on Transit and Trade between India, Iran and Afghanistan signed in May 2016 which will see the development of Chabahar port in South Iran. Although INSTC was originally envisaged through Bandar Abbas, the signing of the Trilateral Agreement has significant impact on furtherance of the objectives of the project. The IAF has enough air assets to support the operationally very important Battlefield Air Support (BAS) mission. In addition to targeting enemy airfields, movement of enemy ground forces, especially their strike corps and reserves would have to be thwarted. In the mountainous region, India would have to interdict and close supply routes by air-action. The Indo-Russian FGFA, which is a derivative of the in-development single-seat Russian Sukhoi PAK-FA, will join the IAF by the end of this decade. For centuries, foot soldiers fought with organic weapons. Maritime operations allowed wars to be prosecuted at much farther distances across seas. But it was the advent of air power in the 20th century that revolutionised war fighting ability both in speed of prosecution and the level of destruction. Since WW II, the war effort has been driven primarily by air power. For initial decades, the air elements were part of the Army and used more like extended artillery. Thus, of the many aerial missions that evolved, Close Air Support (CAS) was among the first. CAS is defined as air-action by fixed or rotary wing aircraft against hostile targets that are in close proximity to friendly forces. These required detailed planning and integration of air-elements, ground fire, troop positions and movements of friendly forces. Often, the risk to own ground forces and attacking aircraft, vis-à-vis the dividend, was high. It was then considered that a more effective mission could be to interdict military enforcements and logistics reaching the battlefield. Thus evolved the concept of Battlefield Air Support (BAS) Mission. War is a costly proposition and the currency of war is life and limb. Leaders at all levels are required to attain the results with minimum effort and risk to own forces. Unfortunately, Indian decision making has rarely considered this factor, and the case studies exemplify these. Having said that, it is reiterated that the reasons of picking such examples has not been to suggest that ‘all was wrong’ but only to point out where the decision making could be different. The aim of revisiting military history as always, is to learn, and hopefully, if the right lessons are learnt, the decision making of India’s leaders in the future would not be found wanting. Given a clear decision, the junior leadership has always proved its mettle, however, it cannot be denied that there is much that is desired from the senior leadership and it is this that requires a paradigm change. Decision making in war is many times more difficult than it is in peacetime due to the uncertainties and imponderables and the currency being blood and life. It is also important to emphasize that this is invariably more difficult for political leaders than for the military, as there are issues beyond the domain of the military; a volatile mix of myriad ‘external’ and ‘internal’ factors. It is in this context that the quote of the Chinese General and master strategist gains salience and it is as important for ‘setting the stage’ and ‘shaping the environment’ to ensure victory ‘before’ the battle, as it was in his time. It is thus imperative to decide on the course of action after having walked through the entirety of the issue(s), set the stage to attain a favourable outcome and in keeping with the desired end state. This requires ‘gaining’ and ‘retaining’ the strategic initiative – both in war and peace. Getting into a war, even when forced into it, without a coherent plan and without definable outcomes can never lead to success. New Delhi: India is laying the groundwork for the formation of a space command to give it a military edge in the tense South Asia region, as Prime Minister Narendra Modi pursues a broader upgrade of the armed forces. Signalling a shift in focus from civil to military use of space, India has expanded its satellite program over the last three years to cover long-distance communication for soldiers in the field, cross-border surveillance and a more accurate use of firepower. The establishment of a space command would help better coordinate those efforts. Seven key civil satellites, controlled by the Indian Space Research Organisation, already contribute to government responses on climate change, agriculture, food and water security, disaster management as well as navigation and communication. The development of a space command stretching across the military “needs to be expedited,” Air Force chief Arup Raha, the most senior officer in the country, said in an e-mailed response to questions. In the meantime, a cross-service Defence Space Agency will be set up under the command of a two-star officer, he said. India Must Not Turn to Medicine's "Dark Side"
All of us have harmless superstitions that we practice, usually without even thinking about them. Maybe you try to avoid waking up on the wrong side of the bed. Maybe you throw salt over your shoulder when you spill it. Maybe you avoid black cats. There really isn’t anything bad about these practices, however, problems can arise when otherwise harmless personal superstitions rise to the level of national credibility, and such is the case in both American and Indian society today. Mirroring the elevation of the Office of Alternative Medicine (OAM) to a full Center in United States in 1998, the Department of Ayurveda, Yoga and Naturopathy, Unani, Siddha and Homoeopathy (AYUSH) was elevated to the Ministry of AYUSH in 2014 under the Hindu nationalist Bharatiya Janata Party (BJP) government in India. This past summer, I traveled to southern India and Nepal and that experience has allowed me to contextualize these events. The BJP and associated groups care deeply about their society and—correctly—see Hindu culture as having long been under assault by colonial powers with proselytistic religions. In their view, compensating for these past injustices requires government to make a proactive effort to promote Hindu cultural practices. Yet, this is where a problem arises. While it’s unquestionable that the Mughals and the British often treated Indians poorly and attacked Hindu culture in order to promote Islam and Christianity respectively, it would be a mistake to oppose everything the Mughals and British did and to instead blindly promote every aspect of traditional cultural practices. For example, few members of BJP today would attempt to defend or resurrect sati, a custom in which widows burn themselves alive on their husband’s funeral pyres. The inhumane practice was ended in part due to the influence of India’s colonizers. While India should certainly seek to regain cultural practices that were suppressed before it gained nationhood and the right of self-governance, it should also learn to reject practices that do not conform to reason, universal human rights, or science. Why Is Pakistan Expelling Afghan Refugees? Over the last couple years, Pakistan has intensified its efforts to repatriate Afghan refugees. The Pakistani government’s attempts in this regard have surged inthe current year with more than 200,000 refugees repatriated this year, half of which occurred in September alone. After the Soviet Union’s invasion of Afghanistan in 1979, Afghan refugees started to pour into Pakistan. It is estimated that over the last thirty years, about three million Afghan refugees have moved to Pakistan. A large part of the registered Afghan refugees have lived in Khyber Pakhtunkhwa and Baluchistan province and the rest are scattered all across the country. In 2002, Pakistan signed an agreement with the United Nations High Commissioner for Refugees (UNCHR) and Afghanistan for a voluntary repatriation of Afghan refugees. Since 2002, besides a gradual and voluntaryreturn, Pakistan has never pushed for repatriation of Afghan refugees. Now, however, Pakistan has warned toforcefully expel thousands of Afghan refugee families if they don’t leave voluntarily.Enjoying this article? Click here to subscribe for full access. Just $5 a month. LASHKAR GAH, Afghanistan — It had been six hours since nearly two dozen Taliban fighters overran a district center just south of here. An Afghan Army unit, backed by U.S. air power, had been rushed in almost immediately to take back the town, but it was pinned down with more than a dozen casualties. 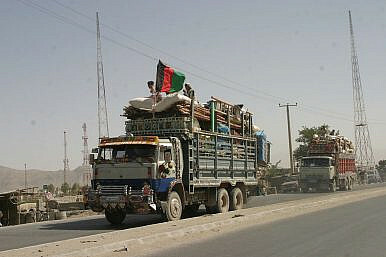 The Afghan troops, a battalion from the embattled 215th Corps, said they needed commando support. With that, the 215 Corps’ commander, Lt. Gen. Mohammad Moune, requested an assault force from the 7th Special Operations Kandak. But for the Afghan commandos, an overused group of nearly a dozen battalions stretched across the country, the units’ skill cuts both ways. The Afghan army, a force with inconsistent levels of competence and with nearly unsustainable casualty numbers, is increasingly relying on the commandos as stopgap cover in a campaign it — more often than not without external support — is losing. The reliance on the commandos risks both burning out the elite force and creating a sense of complacency within the regular army, according to U.S. advisers. China’s role in Africa is changing from resource extractor to long-term strategic partner. Djibouti is a prime example. On April 8, 2016 China’s Ministry of Defense reported that construction of China’s first oversea military base had begun. The naval military base – officially a logistics support base – is located in Djibouti, a small but highly strategic country on the Horn of Africa. The deal ensures China’s military presence in the country up to 2026, with a contingent of up to 10,000 soldiers. China and Djibouti have had diplomatic relations since January 8, 1979, but China’s footprint in the small country has only become ubiquitous over the last few years. Since 2012-2013, Beijing has firmly taken roots in Djibouti through numerous multibillion infrastructure projects including a new port, two new airports, the recently completed Ethiopia-Djibouti railway, a bulk terminal (for potash) at Tadjourah, a salt extraction plant at Lake Assal, water, gas, and oil pipelines, and a liquefaction plant. The establishment of China’s first overseas military installation, which will be located at Doraleh (next to the new port terminal) and Obock, only further demonstrate what was economically already evident: Beijing gives utmost importance to its relations with Djibouti. This large-scale footprint represents a significant departure from China’s traditional role in Africa, often described as a mere resource extractor. Although Beijing’s presence on the continent is everywhere to be seen, and no African country is now without a least a few major projects involving Chinese companies, nowhere else is this footprint so concentrated – and in so many critical industries – as it is in Djibouti. The sheer scale of these projects, combined with the facts that they are concentrated on a relatively tiny territory (roughly the combined size of Beijing and Tianjin Cities in China) and affect a small population (810,000), make China’s presence in Djibouti unique.Enjoying this article? Click here to subscribe for full access. Just $5 a month. Indeed, Djibouti can be seen as a microcosm of China’s experience in Africa, with its benefits, its drawbacks, and its controversies. It can also be viewed as an experiment – for China as much as for Africa. Amid the backdrop of renewed fighting and yet another crumbling ceasefire agreement, Russia, has once again embarked on a concerted effort to fracture the Syrian armed opposition. In a direct challenge to the United States, Russian foreign minister Sergei Lavrov recently accused the U.S. of protecting the Syrian al Qaeda affiliate, and internationally recognized terror group Jabhat al-Nusra, which rebranded in July as Jabhat Fateh al-Sham. While the factual basis of Lavrov’s remarks is steeped in absurdity, the accusations perfectly illustrate Russia’s divide et impera strategy. Russia remains committed to severing U.S. ties to the armed opposition, propagating trends of extremist homogenization, and fundamentally recharacterizing the war in northwestern Syria. A year has passed since Russia’s entry into the Syrian Civil War. It is evident that no side is capable of achieving outright military victory, yet Russia’s sustained air campaign has inflicted a heavy blow to Syria’s beleaguered opposition. To date, Russia has succeeded in both: securing the survival of Bashar al Assad’s statelet and in part, fulfilling the myth of the regime's characterization of the opposition as a terrorist entity. These objectives have come at the price of heavy casualties, accomplished through brute force and an indiscriminate bombing campaign. As such, Russia’s involvement has catalyzed the opposition’s integration and cooperation with Islamist extremist factions. In turn perpetuating the myth that the regime's war is a war on terror. Of course, the trend of moderate integration into extremist elements existed prior to Russia's entry into the war. The near collapse and subsequent irrelevance of the Free Syrian Army as the leading opposition faction was the unfortunate consequence of a cocktail of foreign backing (or lack thereof), toxic ideology, and circumstance. In its place, a plethora of well-armed and equipped extremist factions emerged, securing some of the opposition’s most notable victories, including the storming of Idlib (2015) and championing the continued defense of Aleppo. Following the September 26 premiere of Crisis & Chaos: Are We Moving Toward World War III?, we return this week with a full issue of This Week in Geopolitics. Before we begin, I want to thank the many readers who sent us thoughtful and valuable feedback on the documentary. (If you haven’t watched it yet, you can do so by clicking here). Now, let’s continue looking at the cradle of disorder. If you ranked the civilizations that have most affected the course of human development, Persia would be among those at the top of the list. We forget this because in recent centuries, the various states that have ruled in present-day Iran have been either weak or isolated from the rest of the world. Since the 1979 Iranian Revolution, that has changed, and there was even a short-lived moment (right before the Syrian civil war broke out) where it seemed that Iran was poised to challenge for at least regional hegemony in the Middle East. That chance collapsed, and Iran has been consigned to the position of a secondary regional power for the foreseeable future. The four maps below explain why. Geography has always been a double-edged sword for Iran. In terms of both area and population, Iran is the largest country in the Middle East and the 17th largest in the world. Iran’s main population centers are surrounded by mountains and deserts. This simple fact defined ancient Persian strategy and continues to define Iranian strategy today. Iran’s mountainous geography has made the country extremely hard to conquer, but it has also prevented Iran from easily projecting power abroad. According to Islamic tradition the Prophet Muhammed once said: "Pay the labourer his wages before his sweat dries". But in the devout Gulf states that is one religious instruction employers are often content to ignore. Stories abound of workers being unpaid for months – and sometimes never getting what they are owed. Last Sunday, for example, a group of Indian workers – unpaid since last October – were expelled from the Emirates with a lifetime ban on returning to work there. Their "crime" was failing to renew their visas (the employer had been holding their passports) and as they left the country their retinas were scanned to make sure they would be spotted if they ever tried to come back. One of the group, who had earlier spent 10 days in jail, was allowed to leave without a ban after his brother and friends paid a fine for his breach of the visa rules. A solitary member of the group remains stuck in the UAE ... because the authorities have lost his file. On Thursday, the Indonesian Armed Forces (Tentara Nasional Indonesia, or TNI) held their largest exercises to date off the resource-rich Natuna archipelago in the South China Sea. The exercise marks another notch in Jakarta’s approach to the Natuna archipelago, where tensions have risen with China after a series of incidents involving Indonesian naval and maritime law enforcement authorities and their Chinese counterparts. Indonesia, under President Joko “Jokowi” Widodo, has placed a particular emphasis on safeguarding its maritime sovereignty, in particular against illegal foreign fishing trawlers. The scale of Thursday’s exercise stands out. 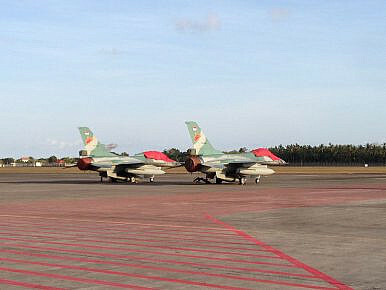 Reuters notes that “hundreds of military officials” and “about 70 jets” were involved in the exercise, which included “a dog fight and dropping bombs on targets off the coast.” Underlining the high degree of executive importance being attached to the Natuna region, Jokowi himself watched the exercise from Ranai, the capital of the Natuna archipelago, which is part of Indonesia’s Riau Islands province. Thursday marked Jokowi’s second visit to the area since June, when he inspected naval patrols in the Natuna Sea. In July, Jokowi’s cabinet met on board a warship in the Natuna region as well. Despite the scale and Jokowi’s attendance, Indonesian authorities, including Foreign Minister Retno Marsudi, sought to defuse the perception that the exercises were in reaction to increasing South China Sea tensions. “It’s not the first airborne exercise we have carried out. We have done it several times. This military training exercise will be conducted by the Indonesian Military in Indonesian territory. It’s not in the South China Sea, but in Natuna,” the foreign minister told reporters on Tuesday, according to the Jakarta Post.Enjoying this article? Click here to subscribe for full access. Just $5 a month. The New York Times appears to have experienced an epiphany of the obvious on Syria. On October 6, its op-ed page ran a piece by Steven Simon and Jonathan Stevenson, both former members of President Obama’s National Security Council, warning against American military intervention in Syria’s civil war. The paper has been a hospitable forum for advocates of military intervention in Syria, academics (some of whom had been senior foreign policy officials) as well as Senators. They had backed the wars in Iraq and Libya but insisted that their recommendations would work this time around. Don’t learn the wrong lessons from history…that sort of thing. Two of the paper’s regular columnists, Roger Cohen and Nicholas Kristof, have penned all-heart-and-no-head pieces describing Bashar al-Assad’s undeniable brutality and calling for the use of American military power to stop it. Neither has yet explained how that would serve American interests, what risks the creation of no-flight zones and safe havens would involve, why such steps are nevertheless necessary, and what they have in mind should events not unfold as anticipated. It’s enough apparently to dwell on the terrible suffering of Syrians and to portray opponents of intervention as latter-day Chamberlains and Daladiers. Appeal to emotion and guilt tripping substitute for hard-headed analysis. So it’s refreshing to read an op-ed in the Times that does what the interventionists have singularly failed to do. The authors, Steven Simon and Jonathan Stevenson, offer nothing new. Others have long since questioned the wisdom of military intervention in Syria, and well before Putin deployed troops there in September 2015. (The warnings of Simon and Stevenson turn largely on the risks of a military clash with Russia.) Still, when a sober analysis on a critical issue appears in the nation’s newspaper of record it gets attention. That makes it valuable, even commendable. Pyongyang’s recent nuclear and missile tests have reignited the North Korea policy debate, generating a sense of “do-somethingism” that pervades Washington policy circles. Recent op-eds (such as those by Jane Harman and James Person, and Mike Mullen and Sam Nunn, both in the Washington Post) reflect this alarm-filled sense of desperation. The spectrum of policy arguments runs the gamut from calls for more generous concessions and negotiating a peace treaty on one end, to calls for “preemption” and “regime change” on the other. But the rumblings from both sides of the debate suffer from historical amnesia, are factually challenged and display flawed strategic logic. Missing from all these well-intentioned efforts at finding a solution is any learning curve from more than two decades of diplomacy by both Republican and Democratic presidents since 1991. There appears to be little appreciation of diplomatic efforts aimed at North Korea’s denuclearization or of the myriad documents diplomats have produced: the Joint Declaration on Denuclearization of 1991; the Agreement on Reconciliation, Non-Aggression, and Exchanges and Cooperation; the Agreed Framework of 1994; the Perry Process of the late 1990s (the search for a grand bargain); the China–U.S.–North Korea talks in 2004; the Six-Party Agreement of September 2005; and the 2012 Leap Day Agreement (the search for a mini-bargain). At Tuesday’s vice presidential debate, Gov. Mike Pence argued for a “safe zone” in Syria, “so that vulnerable families with children can move out of” dangerous areas. But the idea, which seems like an obvious way to alleviate suffering andis also supported by Sen. Tim Kaine, is a practical nightmare with a long history of failure. Safe zones are no alternative to accepting refugees. Safe zones are the strategy of choice for outside powers that do not want to commit to resolving the underlying conflict. But it doesn’t actually alleviate much responsibility. When a zone is attacked, the powers are forced to take sides in the conflict, which is exactly what the policy is supposed to allow them to avoid. And naturally, half-hearted interventions—taking on huge responsibility but being unwilling to discharge it—often turn out poorly. A UN-designated safe zone was first used in Iraq in 1991. It helped the Kurdish forces in northern Iraq keep Saddam’s forces out of Iraqi Kurdistan following the Gulf War. Since then, this case has been trotted out each time policymakers want a limited intervention. But they have never replicated its success for obvious reasons. The operation in northern Iraq worked because the Kurdish peshmerga were on the ground to hold the territory. In 1992, thinking that it was the pronouncement of a “safe zone” that had done the trick, the UN designated Shia areas in southern Iraq “safe.” But without the equivalent forces, the regime continued to attack the region and kill civilians. Not learning from this failure, the UN duplicated its error in 1993. When NATO powers hesitated over intervening in Bosnia, the UN designated the city of Srebrenica as a safe zone for Muslim Bosniaks. It attracted refugees and resisters, but when the Serbs besieged the city, there was no one there to backup the promise of protection, and in the ethnic cleansing that followed, some eight thousand unarmed Muslim men and boys were massacred. Will Obama's Aimless Drifting Lead to War in Syria? This dichotomy reflects a central reality of America’s anguish over the tragic Syrian Civil War—and particularly, now, the heart-rending carnage in Aleppo, under siege from Syrian leader Bashar al-Assad and his Russian allies. What we have is an increasingly urgent call for action based on a foreign-policy philosophy—humanitarian interventionism—versus a presidential reluctance to get involved based on political fear, bereft of any foreign policy philosophy at all. Assad is going for a major strategic victory in Aleppo, and he doesn’t care what the ultimate human cost will be. That inevitably intensifies the call for action from governmental officials and opinion leaders who see a national imperative for action whenever prospects emerge to salve the wounds of humanity and to further the cause of democracy. This is understandable; humanitarian interventionism is a powerful impulse. Thus do we see, as Rogin points out, officials from the White House, State Department, CIA and military Joint Chiefs of Staff engaging in a flurry of meetings aimed at forging military options to present to the president on how he might strike at the Assad regime and turn the tide of battle. One of the biggest stories of the U.S. election cycle has been the allegedly Russian hack into the computer network of the Democratic National Committee. Sidestepping the embarrassing implications of what the hack revealed about the DNC’s behavior during the primaries, the Democratic campaign, along with major U.S. news organizations, framed the story as one of Russia’s nefarious meddling in American democracy. That story has since become central to the U.S. election. In the first presidential debate, it was a key point of disagreement between Donald Trump and Hillary Clinton. Both candidates emphasized the cyber threat, but while Clinton laid the blame for the DNC attacks squarely with Russia, Trump suggested that the hack could have been perpetrated by anyone, from a state security organization to a lone individual. The case is much more complicated than it may appear. • One of Guccifer 2.0’s documents had been previously accessed by a user named феликс эдмундович (“Felix Edmundovich”). Not only was this username written in Cyrillic, but it referenced the founder of the Soviet security services, Felix Edmundovich Dzerzhinsky. BERLIN (Reuters) - German police hunting for a Syrian-born man suspected of planning a bomb attack found explosives in an apartment they raided while looking for him on Saturday, officials said. Police appealed to the public to call them with any information on Jaber Albakr, 22, who was last seen in the eastern city of Chemnitz wearing a black hooded top with a bright pattern on the front. Police detained three people in Chemnitz who they said were known to Albakr, but he remained at large. “Questioning (of the detainees) is continuing. The results are still to come,” said Tom Bernhardt, spokesman for the Saxony state criminal investigation office. Bernhardt said police did not immediately find the several hundred grammes of explosives when searching the apartment as they were well hidden. Hundreds of police including specialist commandos combed a residential area in Chemnitz looking for Albakr. MOSCOW (AP) — A top Russian diplomat is lashing out at the United States because of claims that Russia is hacking political websites and email accounts in an attempt to influence the American elections. Deputy Foreign Minister Sergei Ryabkov said in a statement Saturday that Washington’s accusations are an attempt to heat up anti-Russian sentiment as the U.S. presidential election nears. “The supercharging of emotions about Russian hackers is being used in the pre-election fight; the current administration, taking part in this fight, is not averse to dirty methods,” he said. Russia has built up its forces in Syria since a ceasefire collapsed in late September, sending in troops, planes and advanced missile systems, a Reuters analysis of publicly available tracking data shows. The data points to a doubling of supply runs by air and sea compared to the nearly two-week period preceding the truce. It appears to be Russia’s biggest military deployment to Syria since President Vladimir Putin said in March he would pull out some of his country’s forces. The increased manpower probably includes specialists to put into operation a newly delivered S-300 surface-to-air missile system, military analysts said. The S-300 system will improve Russia’s ability to control air space in Syria, where Moscow’s forces support the government of President Bashar al-Assad, and could be aimed at deterring tougher U.S. action, they said. “The S-300 basically gives Russia the ability to declare a no-fly zone over Syria,” said Justin Bronk, a research fellow at the Royal United Services Institute (RUSI) in London. Russia’s Defence Ministry did not respond to written questions. A senior air force official, speaking on condition of anonymity, dismissed talk of an increase in supply shipments. On 10 September 2016, US Secretary of State John Kerry and his Russian counterpart Sergey Lavrov announced a cease-fire agreement in Geneva following negotiations that lasted over ten months. The agreement was not a cease-fire between Russia and the US, but one between their proxies. Russia was answerable for President Bashar Assad and his allies that include Russia. The US was responsible for the ‘moderate’ rebels supported by the West and its allies. The two major rebel groups, ISIL and Jabhat Fateh al-Sham, were excluded from the cease-fire. Since the cease-fire has been violated a number of times, one may assume that those who signed the agreement did not have full control over those who fire. This cease-fire is a strange one. No text was shared with the media. There was not even a joint communique. It was given out that there were five texts which will remain secret. There was only a joint press conference. Lavrov took pity on the journalists waiting for hours and handed over some pizza around midnight and added that it was from the US delegation. A little later, he re-appeared with bottles of vodka, this time from his own delegation. Perhaps, the intended message was that the two sides were about to make a deal. A week-long cease-fire to take effect from 12 September, but initially valid for 48 hours and renewable for the same period from time to time. During the cease-fire, the Syrian government should refrain from flying combat missions in areas “agreed on with real specificity”. There should be “unimpeded and sustained humanitarian access to all of the besieged and hard-to-reach areas including Aleppo”. The US will get the ‘moderates’ to separate themselves from the Jabhat Fateh al-Sham so that, at the end of the cease-fire, Russia can bomb the latter without hurting the former. The US and Russia will create a Joint Implementation Centre for the “sharing of information necessary for the delineation of territories controlled by (Jabhat Fateh al-Sham) and ‘the moderates’ in the area of active hostilities”. If the cease-fire holds, Russia and the US will coordinate or cooperate in the fight against ISIL.